You know when you and your friends are riding and filming the topic of “we should make a video” has probably come up at some point or another. Most of the time, it is all talk and never happens, then a lot of the time the video doesn’t turn out all that good and nothing happens, and then theres what happens with this, the video turns out good and it is all fun and real relaxed. I got the chance to review the No Bikes DVD Four Corners. I am really glad I had a chance to see it, I have been hearing stuff about it through Bikeguide’s forum for a while. I was real excited to see Matt Dessons part too since hes a pretty frequent poster on there and his riding is always pretty good. What I was most shocked to find out is that this vide is their 6th video, so they have been getting stuff done for a long time now. This video is real cool too because there is riding in Alaska, Florida, Tiawan, and British Columbia. This means there is a lot of different spots. So here are my notes right below here. 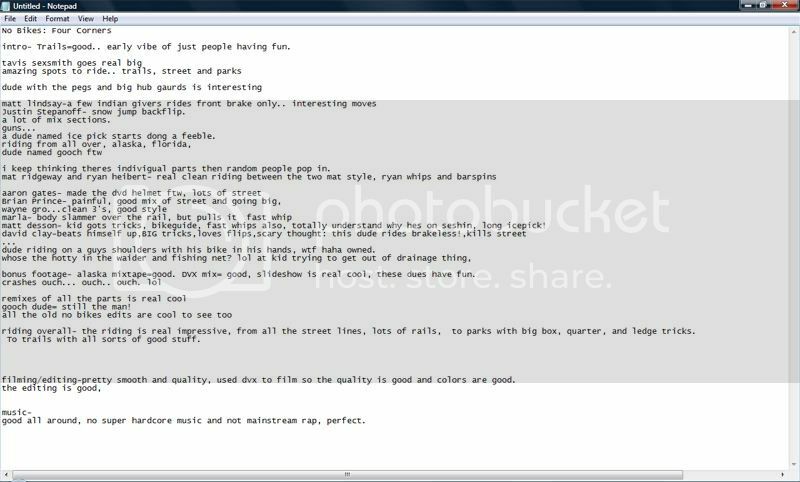 The video’s intro starts out and I immediately got a good vibe from the video, I knew it was going to bring a relaxed feel to it that was just people having fun. The riders in this video shocked me, I seriously only have heard about Matt Desson and that was about it but a few other guys really stood out. Desson is on 1664. The first person who stood out was Travis Sexsmith the dude goes so big, and is real smooth. Im surprised that kid is not more heard of. Travis is on Macneil flow. There was a guy with big hub gaurds who had a bunch of really interesting he had a style that stood out to me for a fair share of the video. Throughout the video there was clips of something you never see, they built a box jump out of plywood and snow, I mean this wasn’t a huge shock to me since I have experienced winter, but they have some random clips of it throughout the video, real good. The video starts with a mix of a lot of different riders doing their thing, the riding is pretty solid too. A lot of the mixed sections, I kept thinking they were going to be a persons part with the big name, but I guess not haha. There is a dude named Gooch in this video. This guy rides real good, and has the coolest name ever. I think there needs to be more gooches in this world. well, at least the name wise an riding wise. The first part is Mat Ridgeway and Ryan Hiebert- Opposites attract to make good parts. Mat is more of a flow style guy who throws the occasional barspin, whip, and flip. He mostly just goes fast and big. Ryan is the kind of more tech, a lot of barspins and whips, real street and park dog. Had really clean tricks that were very consistant. Aaron Gates is the dude who made the dvd, he made the video, is going to probably get a lot of hate from the “anonymous” crew since he rides with a helmet most of the time. I have a lot of respect for him for wearing a helmet I wish I was smart enough to do that. He had some good riding and also made the video real good. Brian Prince- He had a lot of bad crashs getting footage for his part, shows, but he has a lot of good riding that mixes between slower street tricks and then had some real big tricks, real good tuck no handers. Wayne Anasogak, spelled his name real wrong is my notes.. This dude has some real clean 3’s and pretty solid style. The street guys will like this part. Marlo Karjala- Has a real good slam in the beginning doing a 180 over a rail, and also does one of the fastest whips I have seen over a tiny hip. and is capable of doing them on street, dirt, and park, so he is an all around good… I thought he was on Seshin? The video ends with David Clay, this dude is wild. This kid has all the tricks, did a big 180 barspin over a bench, front flips, 3 backflips?, all sorts of wild tricks. This guy scares the crap out of me, why? Because he rides brakeless. Scary! The bonus part is good, a Alaska mix, Dvx mix, Crash section, slide show, and a bunch of other good stuff, theres about 25 minutes of bonus stuff. I really liked that. There was a clip of one dude riding on the shoulders of another dude on a bike, while holding his bike.. yeah try and imagine that one. He then gets closelined by a tree which was real funny haha. The riding overall was good, they have a lot of fun. The guys all must push each other to ride better because they all are capable of some big, and difficult riding. Real stoked on how a bunch of guys who are stuck in a not so rideable place make it work for them. The filming was pretty smooth and quality, they used a dvx to film so it isn’t some cheap consumer camera getting the clips. The colors were good too. On the editing side, it is aparent Aaron has made a few videos in his day, he makes it flow together real good, no clips that didn’t get cut right or anything. High five on that one. The music is good because of a big reason I have, it was right in the middle. There wasn’t any heavy metal raaaaw! type stuff where you can’t even understand the dude singing, and there was no main stream rap music, it was all more unheard of and lower key bands and artists. I really liked that, and it was something that I think takes talent. That is finding music and not just going for whats hot. Overall I think the DVD was good stuff, it has a great vibe and worth checking out. For even more information on the DVD check out the interview I did with Aaron to get more info going on the dvd for you kids..
and here is the trailers..
Four Corners Trailer from no bikes on Vimeo. 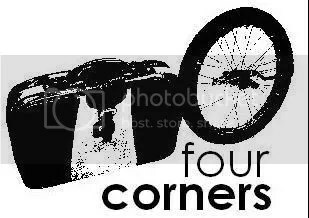 four corners, out now from no bikes on Vimeo. four corners woooo! good video. good review man.